Perhaps this should not be profound to me, but it is! The first action God takes in Scripture is to speak. And by speaking, things are created. Exodus 33 says that God spoke to Moses face-to-face, as to a friend. In contrast, Scripture says that idols have eyes but do not see, mouths but do not speak (Isaiah 44). We were challenged in class to consider how often we are like the Israelites, desiring God to act more like a golden calf. Be regal, in a place of honor, receiving our worship and be a point of reference for all the prayers we lift up. But God is not like the idols. He is LIVING, and he speaks. Are we listening? Do you expect him to talk to you? Hi! This is a shout out to all of us who ate WAY too much over the Christmas holidays. Peppermint bark, anyone?! We made this for dinner tonight-- it's lo-cal, low fat, HIGH on flavor. And it's an easy thing to make double of for an easy, no microwave lunch tomorrow. I hope you enjoy! Roll it up! We ate it with a side of blueberries and oranges. Costco has really big, sweet blueberries right now! I've discovered that it is very difficult to put onto paper the massive amount of growth I've been experiencing. Over the holidays when trying to explain to family and friends (and aunties) about how the semester has gone, I feel like I imagine a teenage boy would in trying to explain how his voice dropped overnight or what it feels like to grow 8 inches in a year. So instead of trying to grasp the entirety of this newness I'm feeling, I will be diligent in sharing tidbits with you. Today was another reminder that I am a sinner saved by grace. Do you have a children's Bible handy? If you do, please take a second and get it. Okay-- turn to the story of Noah. It'll be before Abraham but after Creation. How does yours describe Noah from the outset? Does it begin by saying that he is good? Does it start like this one? One more. Is yours like this? This book gets it right. This is more of the intro we want to aim for. Do you see the difference? Let's discuss. The first mention of Noah comes in Genesis 5 when we get the genealogy from Adam to Noah. 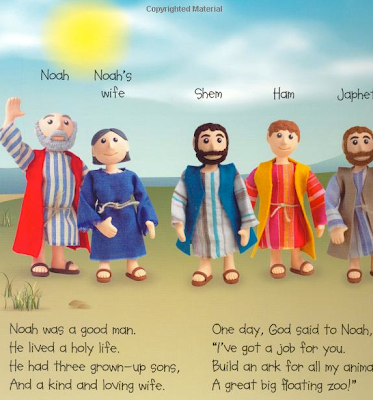 All we find out by the end of chapter 5 is that Noah had 3 sons after he was 500 years old that we should know about. The beginning of chapter 6 backs us up to explain what the state of the world was at the beginning of the genealogy in chapter 5. In 6:5 we know that the state of the world was "that the wickedness of man was great in the earth, and that every intention of the thoughts of his heart was only evil continually." It proceeds to tell us that the state of the world was such that it went from all being good in Genesis 1 to the point that God was "sorry that he had made man on the earth." Whoa! BUT... and don't we all love a good but to interrupt a terrible statement. 6:8 says, "But Noah found favor in the eyes of the LORD." 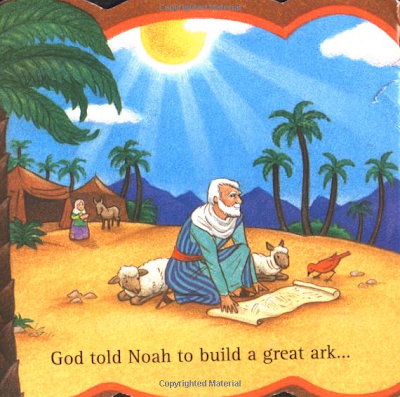 Before we know if Noah was good or righteous, which is the beginning of most of children's Bibles, Scripture tells us that the most important thing about Noah is that he is favored by God. You'll most often hear grace described as unmerited favor. 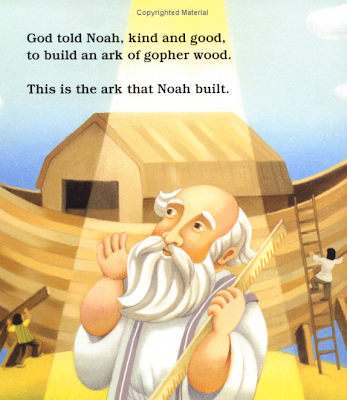 Noah was a recipient of God's favor, of his grace. Does this save Noah? We learned in class today that the differentiator between God and the other gods from ancient times is that God speaks. The idols do not (Jeremiah 10:5). So Noah finds favor (receives grace) from God, and God says to Noah that he is going to destroy the earth, in 6:13. Noah could still have been washed away in the flood even when he knew that God was coming to destroy it. But in faith, though he has never seen a single rain drop, he builds the ark that God describes. And he is saved from the flood. Carol Kaminski, our professor, said today "Noah walks in faith when God warns him of the flood. The vehicle of salvation requires faith in what God says." 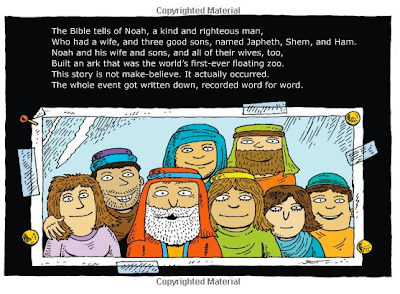 Noah is included in Hebrew's "hall of faith" in 11:7: "By faith Noah, being warned by God concerning events as yet unseen, in reverent fear constructed an ark for the saving of his household. By this he condemned the world and became an heir of the righteousness that comes by faith." So the children's books do have it right. Noah is in fact a righteous man, and he walked with God (Genesis 6:9). But by mentioning it first, they imply that it is Noah's right-ness, his goodness, that makes God choose him to be saved. It is God's grace, his favor, that allows Noah to hear God's plans. But it is the acting out of his faith that makes him righteous. Is this not true of us? Romans 3 explains to us that no one is righteous. It is by grace, God's unmerited favor, that I am studying these things. It is by faith that I believe them to be true and act in love to share this knowledge with others. We are made righteous by our faith in Jesus Christ, as it says in Romans 3:22, though we have not seen him. I pray that you will also believe in the grace extended to you and walk in faith. I hope you read this entire passage, Ephesians 2:1-10. But here's the punch line: 2:8 "For by grace you have been saved through faith. And this is not your own doing; it is the gift of God..."